Curtiss SB2C Helldiver 1. A-25A-10-CS part: 13th FS USAAF number: 41-18826 1944-1945 years. The aircraft cabin with a lantern of the old model. 2. SB2C-4E of VB-87 from the USS Ticonderoga on 29 May, 1945 with empty bombrack and rocketrails. 3. SB2C-1C Unit: VB-2, U.S. Navy Serial: 18 CV-12 USS Hornet on 3rd July 1944. 4. SB2C-4E of VB-84 during Bunker Hill Tokyo Raids of 16-23 February, 1945. 5. SB2C-5E of the Aeronavale Esc 3F in Vietnam 1954. 6. Curtiss SB2C-3 of VB-3, USS Yorktown (CV-10), February 1945. 7. 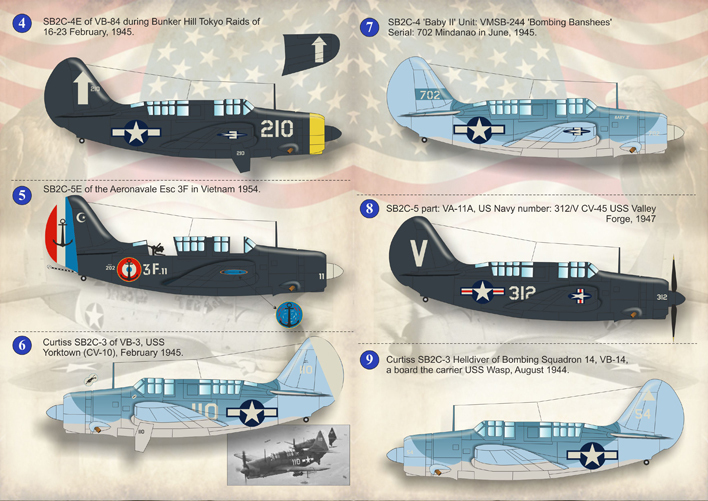 SB2C-4 'Baby II' Unit: VMSB-244 'Bombing Banshees' Serial: 702 Mindanao in June, 1945. 8. SB2C-5 part: VA-11A, U.S. Navy number: 312/V CV-45 USS Valley Forge, 1947. 9. Curtiss SB2C-3 Helldiver of Bombing Squadron 14, VB-14,a board the carrier USS Wasp, August 1944.